Legendary movie star Paul Newman died Friday at his home near Westport, Connecticut, after a long battle with cancer. He was 83. The fascinating obituary written by Lynn Smith and published in the Los Angeles Times this morning quotes director Arthur Penn, who said, “He’s a majestic figure in the world of acting . . . He did everything and did it well.” By “everything” I think Penn means that Newman excelled in both comic and dramatic roles, and that is true. He did it all, and he did it well, and that’s perhaps one of the finest compliments one could make to an actor. 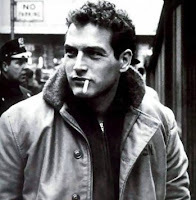 Paul Newman was a great actor who also happened to be a great movie star. There are very few feature films in which Paul Newman appeared that are not worth watching; I suspect that I’ve seen them all, and several of them many times. I’ve always admired his films because of the offbeat characters he chose to play, quirky, if charming, misfits who always seemed to have an immense inner reserve, a resilience and self-reliance that made them irresistibly compelling. The scene, so wonderfully understated, in Cool Hand Luke when his, Luke’s, dying mother—brilliantly played by Jo Van Fleet—comes to visit him at the rural prison where he’s being held is, in my view, one of the finest moments in the history of American cinema. I have watched that scene over and over, and never tire of it. Cool Hand Luke is, in a way, exemplary of the significant contribution he made to American cinema, the image of the American anti-hero. Beginning with his sympathetic portrayal of Billy the Kid in The Left-Handed Gun (1958), he continued to develop the anti-hero image in classics such as The Hustler (1961), Hud (1963), Hombre (1967), Cool Hand Luke (1967), and, of course, the immensely popular Butch Cassidy and the Sundance Kid (1969). Hud and Cool Hand Luke are two of the finest films of the 1960s; Hud, a compelling morality play, is one of my favorite films of all time. He continued into the 1970s playing unusual characters in some very interesting films, including WUSA (1970), The Life and Times of Judge Roy Bean (1972), The Sting (1973), Slap Shot (1977), and two films for Robert Altman, Buffalo Bill and the Indians (1976) and the unaccountably neglected Quintet (1979). "There but for fortune" seems to be an idea of which Paul Newman was keenly aware. In any case, his contribution to the American cinema was a significant one, making him as legendary as other actors of his generation such as Marlon Brando, James Dean, and Charlton Heston. His family suggests donations in his name to the Assn. of Hole in the Wall Camps, designed for children with life-threatening diseases. Information is available at: www.holeinthewallcamps.org.